With equity indexes closing moderately mixed, the VIX cooled, settling -2.1% @ 14.50 (intra high 15.49). Near term outlook is uncertain, not least because of the building Greek situation. 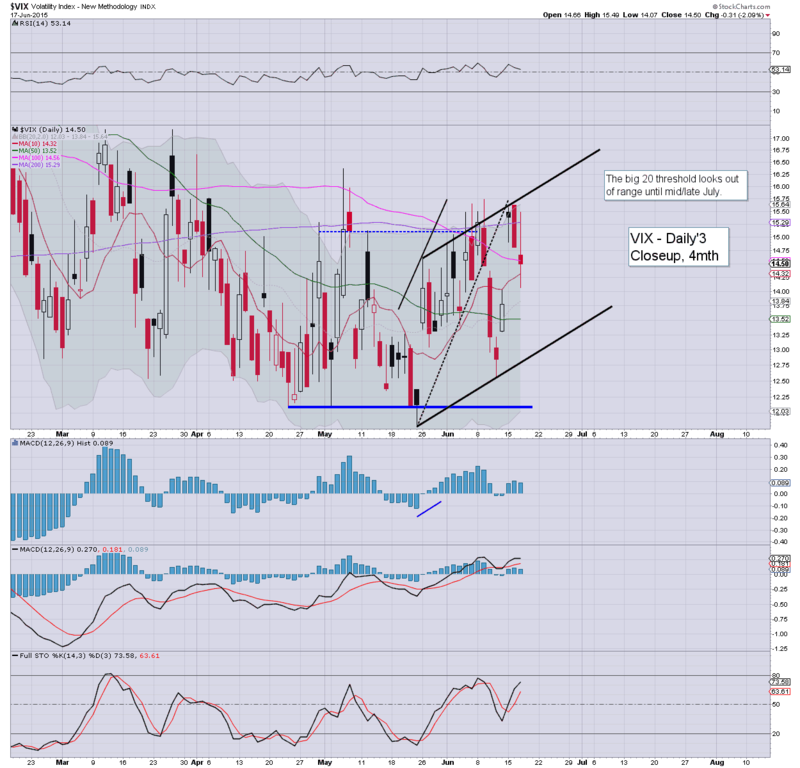 The big VIX 20 threshold still looks out of range in the near term. *considering the ongoing 'Greek situation', the VIX remains bizarrely low. It was notable today to see a few large July VIX call blocks be picked up... as some are seeking to have protection against a Greek default within the near term. The big VIX 20 threshold looks out of range in the current cycle. 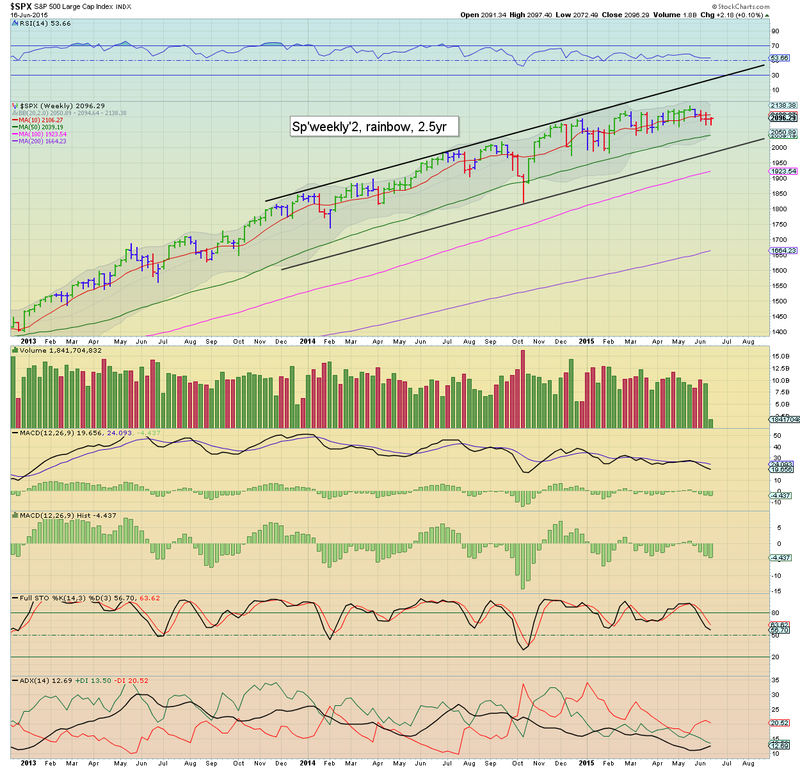 US equity indexes closed somewhat mixed, sp +4pts @ 2100 (intra low 2088). The two leaders - Trans/R2K, settled lower by -0.4% and -0.1% respectively. Near term outlook remains uncertain, whilst Greece remains on the edge of a weekend default. 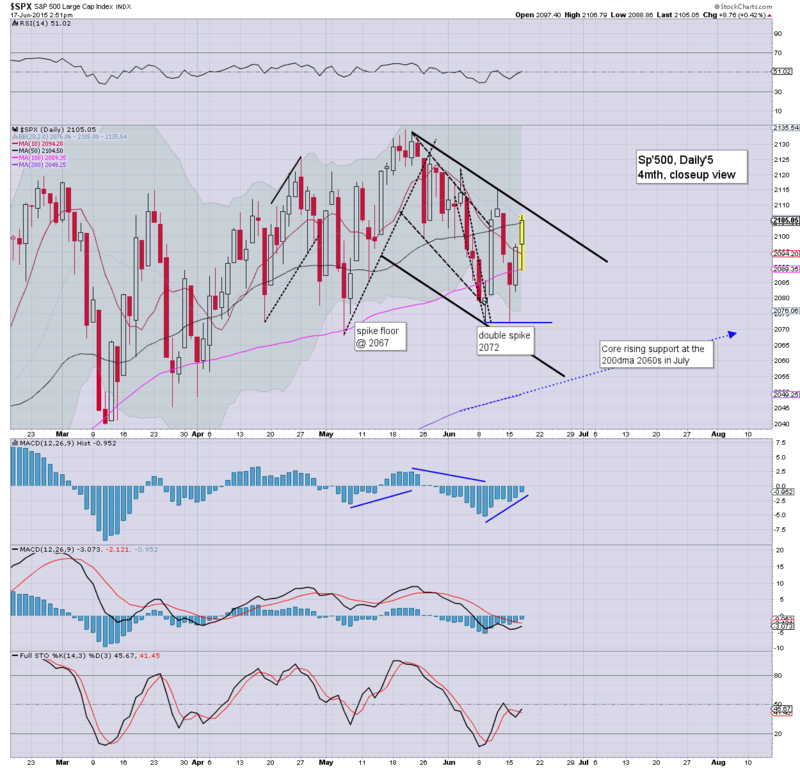 The second consecutive net daily gain for the sp'500, but with moderate weakness in the two market leaders. Overall.. it is a bit of a mess. Until we're back over trend resistance of sp'2110 or so... there remains threat of renewed downside (if briefly).. purely due to increasing Greek concerns. most notable aspect of the day... USD -0.8% in the DXY 94.20s. The Fed have not surprisingly not raised rates, and instead have released a statement offering more rainbows and unicorns.. not for 2015.. but next year. Mr Market is seemingly more than pleased, and is rallying on the news.. not least helped by a bizarrely cooling USD, -0.7% @ DXY 94.30s. 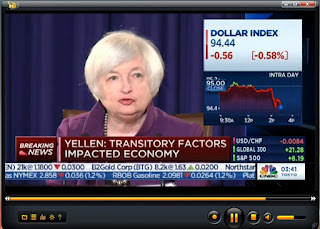 Yellen is so far placating the market, not least in terms of 'gradual rate hikes', whilst US growth is still being touted as strong. Not surprisingly.. word of the day is 'Transitory'. For those playing the drinking game... please dial 911 within the closing hour. 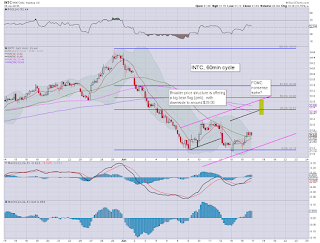 As for INTC which I have babbling about recently... its approaching an interesting zone.. but with broader market action... I sure ain't interested in meddling today. Will assess again tomorrow. 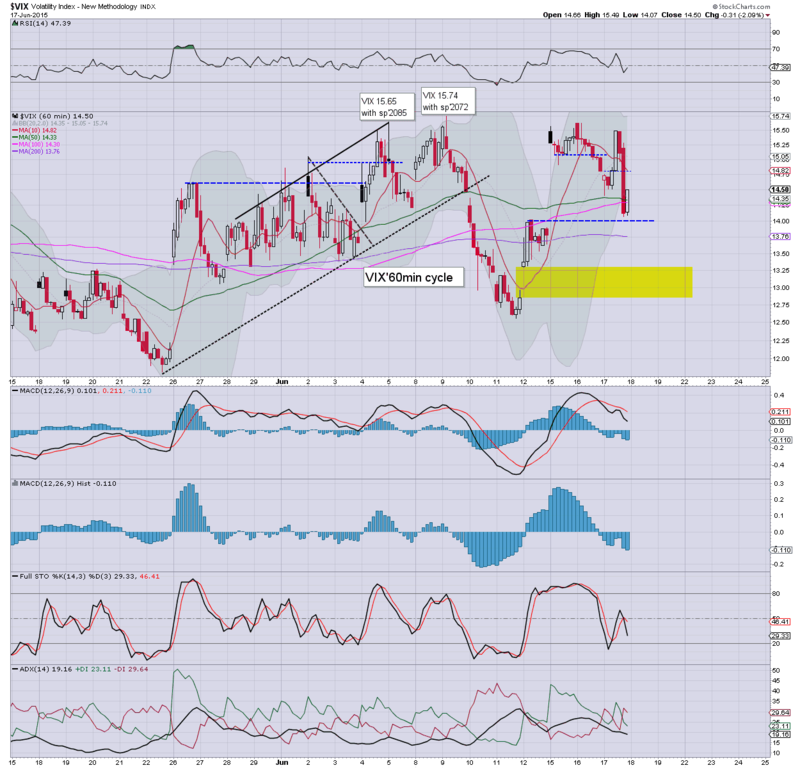 3.06pm.. USD still cooling, -0.8% @ DXY 94.20s... we are just 200bps from target zone of 92/90. A mid term turn looks on track for late June/early July.. and then .... 120s...which I realise sounds like 'crazy talk'... but then so was the notion of DXY 100.. last summer. 3.15pm.. Anyone else miss Bernanke? Or is it just me? 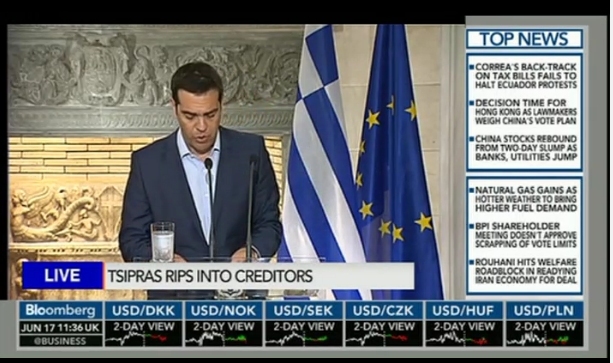 After all....Greece is going to default.... real soon. 3.18pm One of the media hacks has dared bring up the issue of the judge who ruled that Fed did not have authority to take control of AIG. 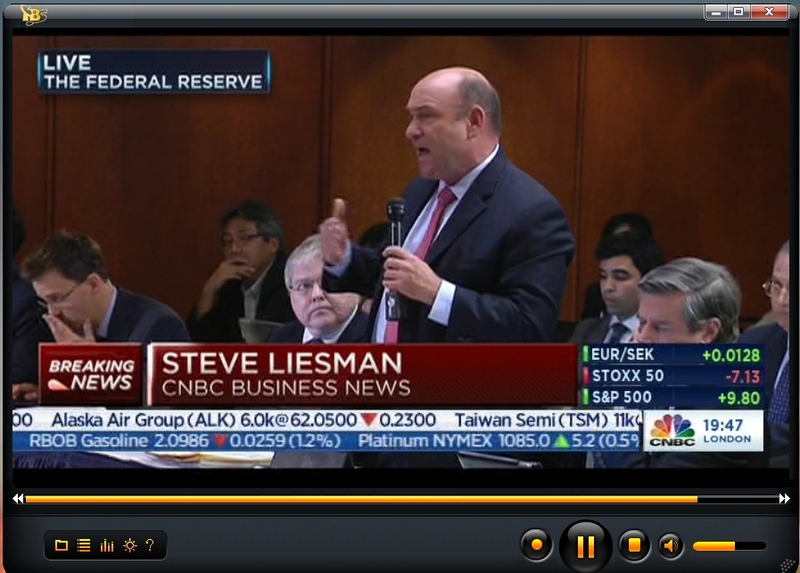 This guy won't likely be invited back for the more important Sept'17th FOMC/press conf. 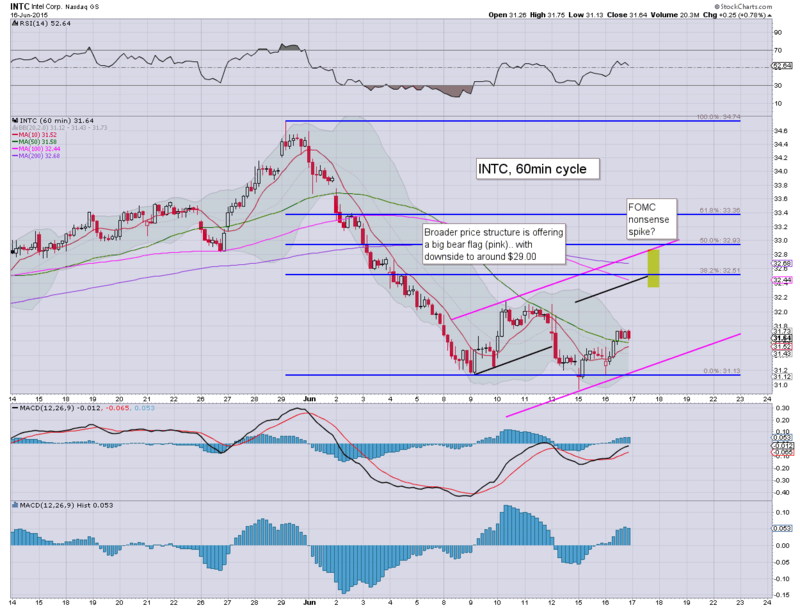 notable strength: INTC, +1.2% in the low $32s... more on that one.. on my 'fair value' page after the close. 3.31pm.. and the CEO of print central... has concluded. 3.47pm.. minor chop.... net gains still look due.... although R2K is -0.1%. Its time for the fourth FOMC announcement of the year, no rate hike is due.. but there should be plenty of word games in the press release.. and in the Yellen press conf. Price action will likely be somewhat twitchy, especially in the precious metals and currency land. Suffice to say... the setup doesn't favour the bears, with the smaller 5/15min cycles offering renewed upside after 2pm. 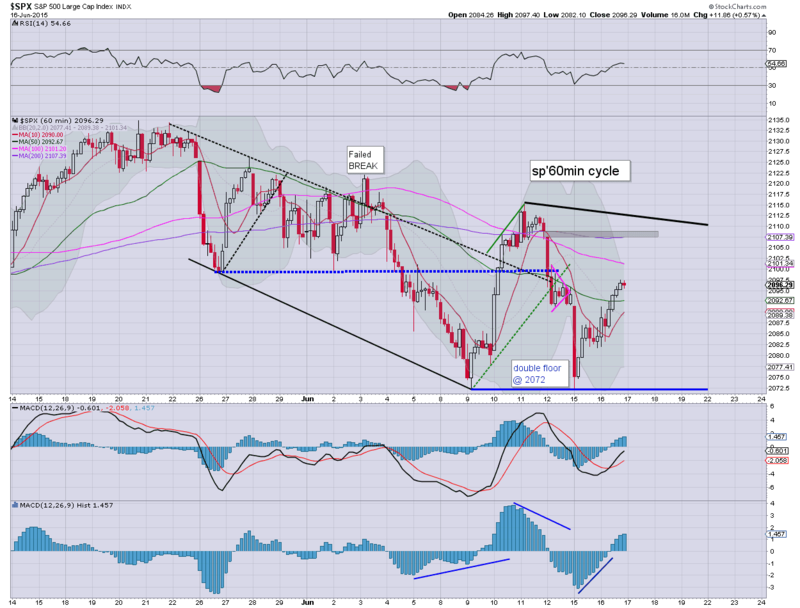 The hourly cycle is offering a bearish turn before the close... but right now... I don't much like the setup. Eyes sharp... VIX, USD, metals/oil... and of course.. the indexes. 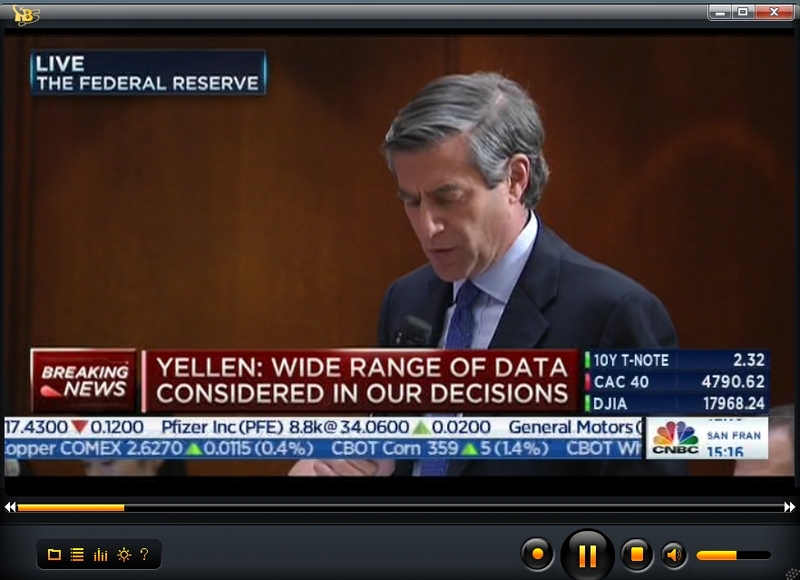 2.01pm... rates unchanged of course... Fed 'upgrades economy'.... go figure the disparity between those two. 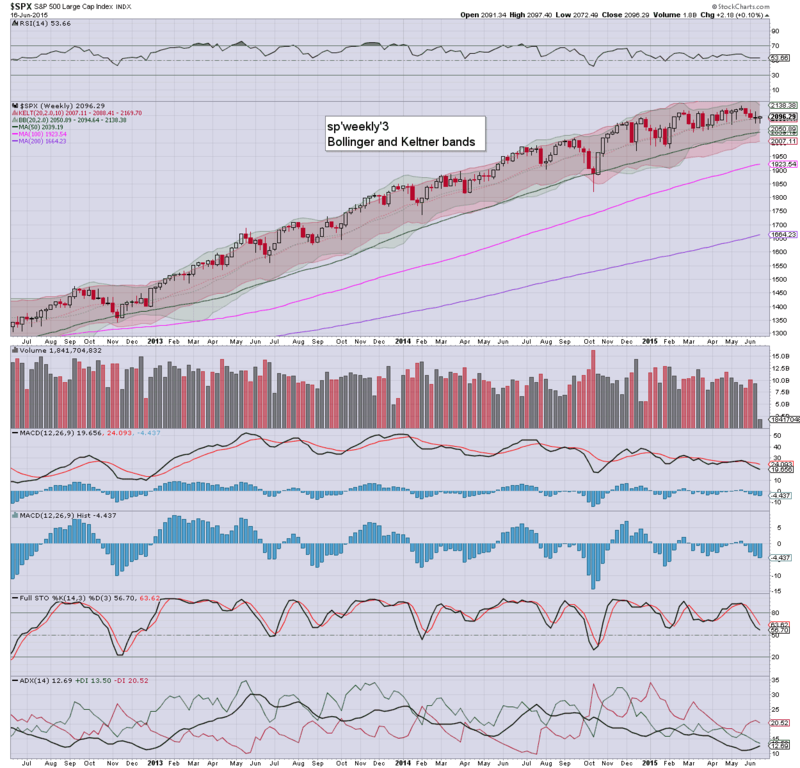 Indexes twitchy... to sp'2088.. but snapping to 2097. No doubt... stops being hit both sides... annoying a great many. Bull maniacs really need a break >2105... where there are a few aspects of resistance. 2.11pm.. USD -0.5%.... incredible, when you consider the Euro/Greek situation. 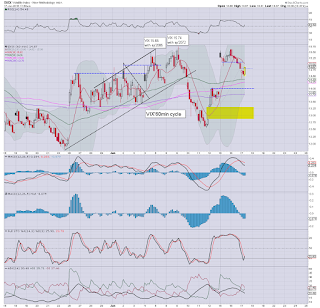 Target remains DXY 92/90 zone before a mid term turn. 2.22pm... Update from the overly loud Mr C.
.. chop chop.. sp'2094... ahead of Yellen. 2.34pm... First use of 'transitory'.... if you're playing the drinking game. 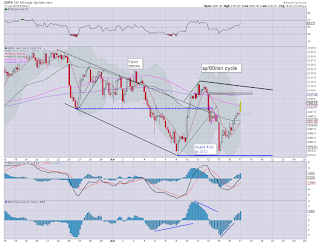 Market looking increasingly pleased with the world.. after all.. Greece is fine too.. right? USD remains weak, -0.4%.... for me, that remains the really bizarre (if expected) aspect..
2.41pm... Another short-stop cascade... sp'2102.... bull maniacs are taking control... with all this nonsense 'transitory' talk. 2.43pm.. sp'2105..... breaking the 50day MA.... bears getting washed out... as USD cools.. and that is helping just about every asset class. 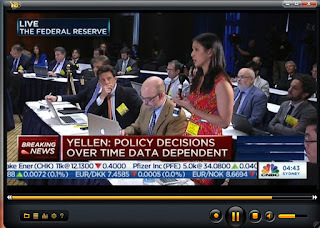 Did Zerohedge not get their yellow ticket/pass? Equities have turned a little lower ahead of the FOMC, and in some ways, this is ironically bad for the bears. 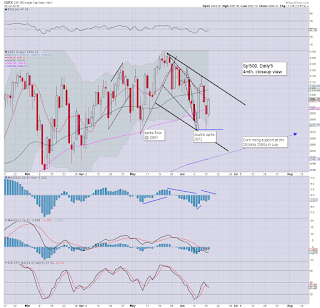 The bigger daily cycle is offering a clear fail at the 50dma, but for now.. its getting increasingly messy. USD is similarly choppy, -0.1% @ DXY 94.90s. *I'm getting increasingly tired of things today... I'll stick around, but I ain't much in the mood for hitting any buy/sell buttons. notable weakness: TWTR -1.6%... daily/weekly cycles look lousy for rest of the summer. ...back just before the 2pm announcement. US equities remain in a classic holding pattern ahead of the 2pm FOMC announcement. What will be more interesting is how the market reacts to what the Yellen has to say at the press conf'. USD is back to u/c @ DXY 95.00. 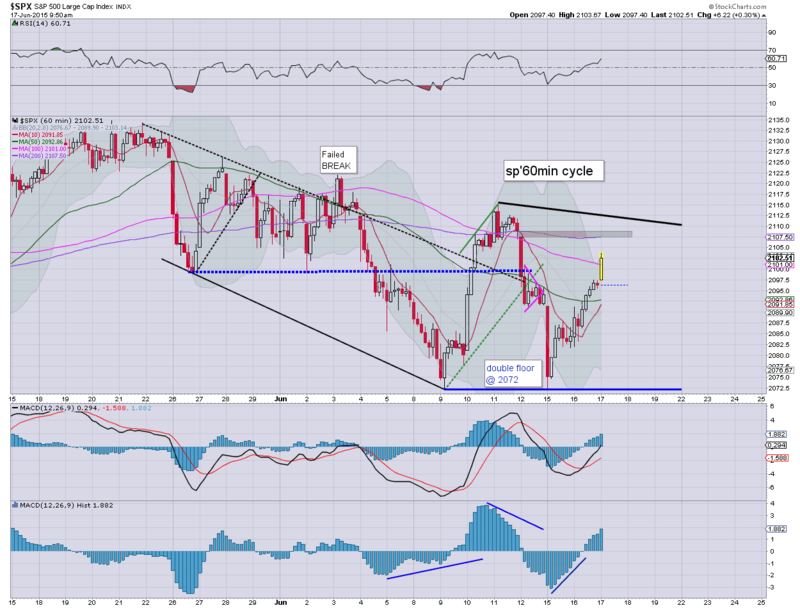 Metals remain somewhat weak, Gold -$5. 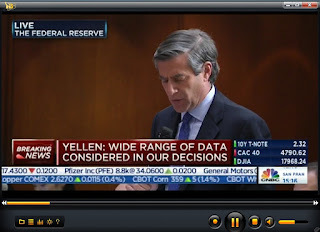 Clearly, the Fed aren't going to raise rates today... so it is merely going to be a case of more word games, and whether the market will 'sell the FOMC'.. having climbed from the double floor of sp'2072. US equities are moving into minor chop mode.. ahead of the FOMC. There remains a high chance of the 'spike higher and reversal' scenario this afternoon. With the USD turning positive, +0.1% @ DXY 95.10s, the metals are under pressure, Gold -$6, with Silver -0.3%. 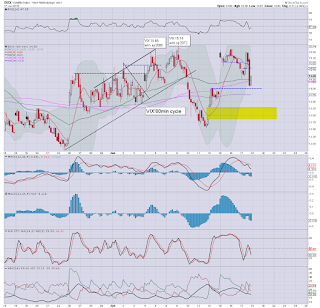 *price structure is a bear flag in Gold.. although I'm not particularly in the mood to re-short it. 3 hrs until the Fed nonsense.... market will now surely just remain in a holding pattern until then. notable strength: TSLA +3.2%... did they sell another car this week? 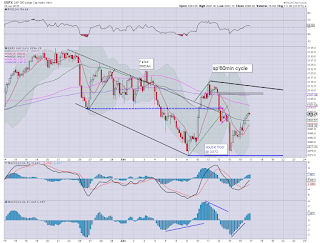 US equities open moderately higher, although it will be difficult for the market to go much above sp'2105/10 today. USD remains in cooling mode from the March high, -0.2% in the DXY 94.80s. 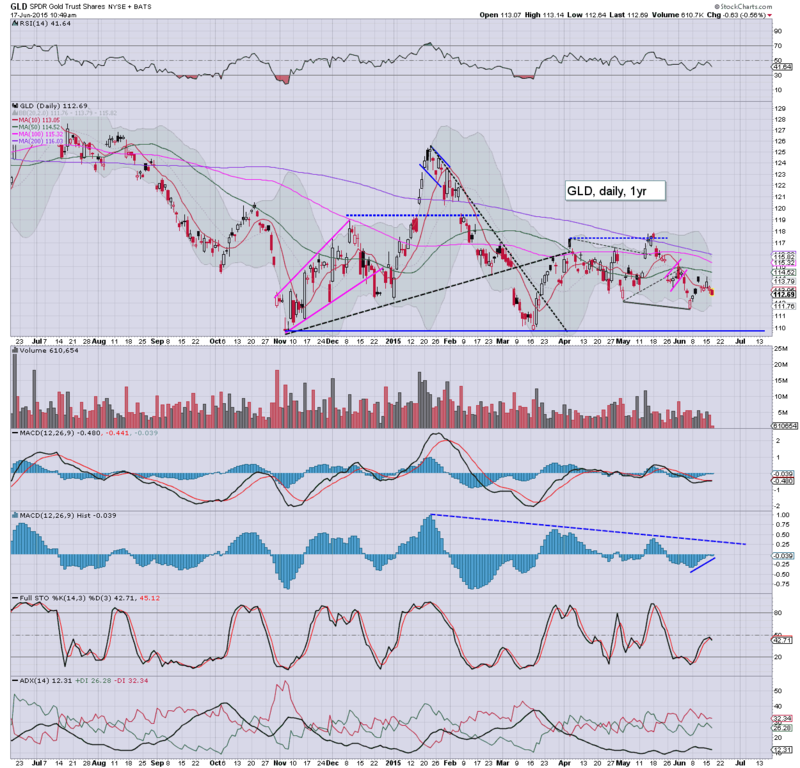 Metals are weak, Gold -$3, and will be highly vulnerable to a snap this afternoon. Oil is holding early sig' gains of 1.5%. *VIX is naturally cooling with rising equities. A brief spike low in the low 13s is viable this afternoon. For those looking to short the market, that will be something to watch for. We have a very long day ahead... with the market likely to see some degree of FOMC spike this afternoon... and I'm guessing it'll be to the upside. It would be somewhat amusing if we then see it all unravel after the CEO of PRINT central starts talking. I am quietly watching INTC, currently +0.7% @ $31.84.. a break into the $32s still looks viable.. before resuming lower to $29s. Good morning. Futures are moderately higher, sp +5pts, we're set to open at 2101. The USD remains a little weak, -0.1% in the DXY 94.80s. Metals are weak, Gold -$2. Oil has jumped 1.8% ahead of the latest EIA report. Today is starting much like yesterday. 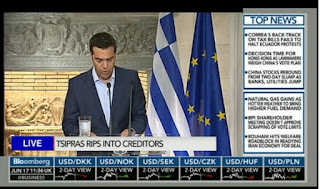 Here in Europe... the Greek leader is at it again.. more whining and bitching about the creditors who have helped keep Greek financially afloat for years... if not decades. It would almost seem like he is wanting to antagonise the EU/ECB/IMF, and subtly prepare the mainstream for a default. Right now an actual exit from the Euro seems unlikely..at least until a default has occurred..and faded a month or two into the past. *as for yours truly today... 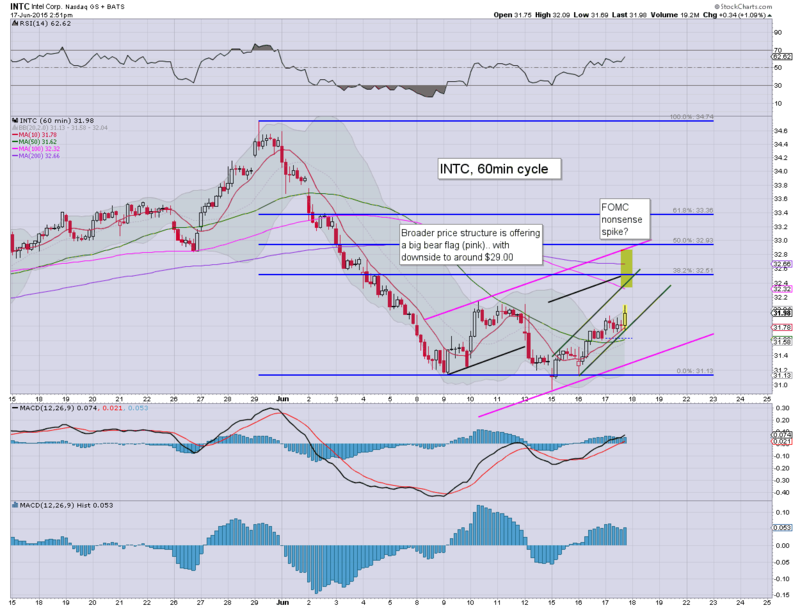 I will have my eyes on a possible INTC short. Broader price structure is highly suggestive of the $29s within the near term.. and it would be one way to be short the market. I will assess after the FOMC announcement at 2pm.... I am certainly in no hurry. Frankly, I think Embry is badly wrong... at least in the near/mid term. Metals are highly vulnerable to another major wave lower. Gold still looks set for the giant $1000 threshold, not least if the USD breaks >DXY 100 later this year. 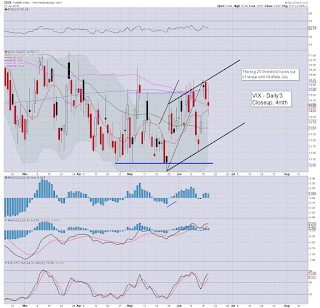 Overnight action, China +1.6% @ 4967.. having ramped from an earlier low of 4767... the Shanghai market is becoming more volatile...often a sign of a short/mid term top. 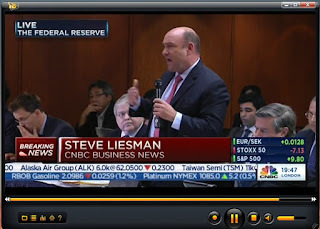 Cramer '... you don't take on the IMF, they are like the Impossible Mission Force'. Seems the defendents of the IMF are coming out of the woodwork this morning... as the Greek leader continues to slate them. It was a day for the equity bulls, with the sp' +11pts @ 2096. 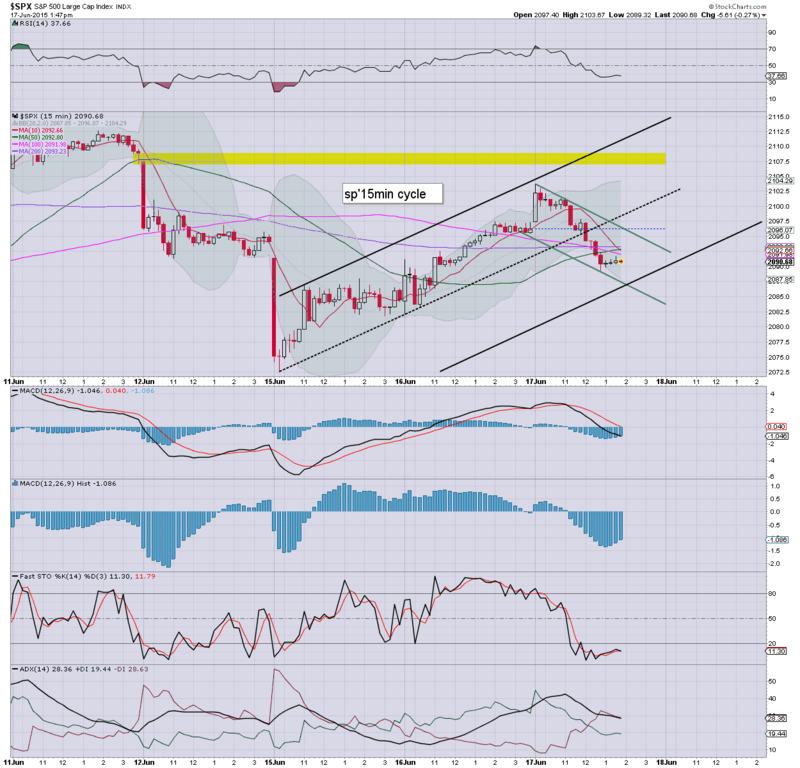 Yet, with the FOMC tomorrow, and the ongoing 'Greek situation', there will be renewed opportunity for the bears to whack the market lower into the weekend. From here on.. there is high risk of a Greek default across any given weekend. 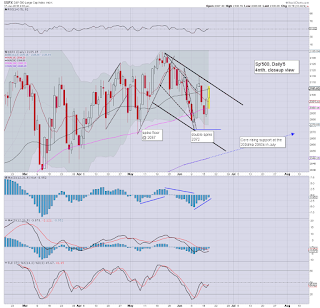 The third consecutive red candle on the weekly 'rainbow' chart. 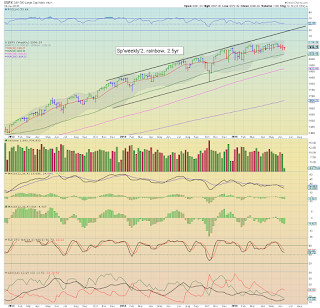 The lower bollinger is offering downside to sp'2050... where there are multiple aspects of support. 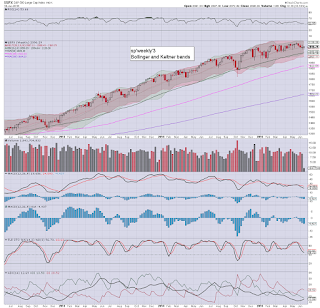 Right now... there is core trend support (from the Oct' low) of 2000/1980. 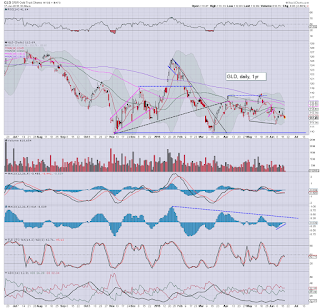 Clearly, if the Greek govt' decide to default, any market washout will likely level out around 2K.. at least initially. 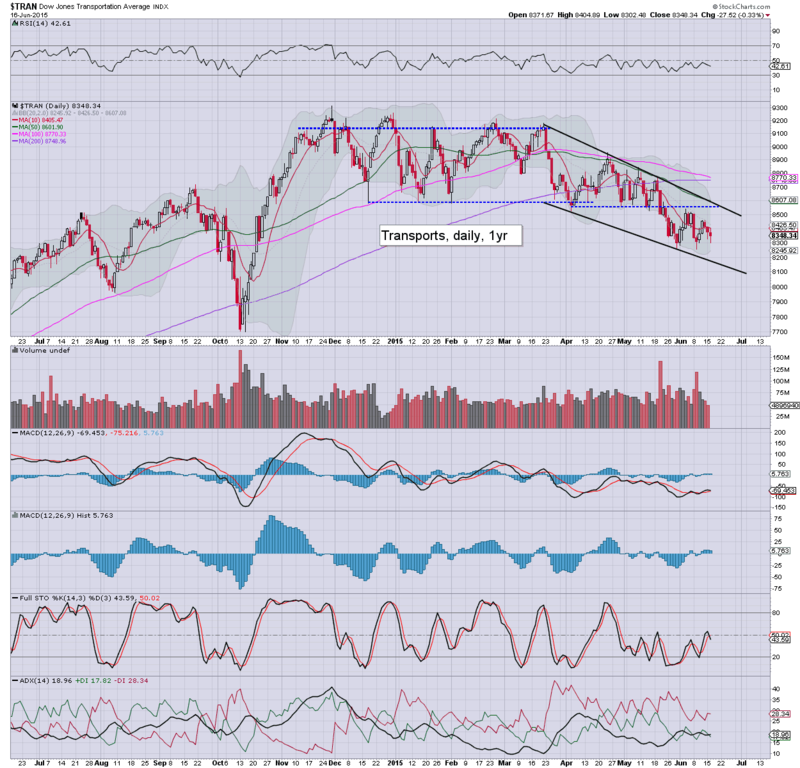 *as noted at the weekend, by late summer, best case downside for the Dow will be in the 16500/000 zone. 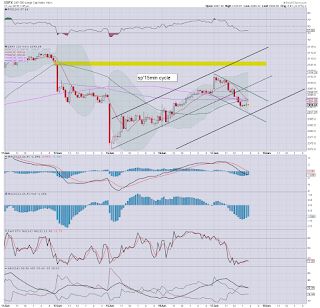 Under no scenario (whether GREXIT, and/or higher rates) can I see sustained price action <16K. Wednesday will see the latest EIA oil report.. oil bulls should probably be seeking a net draw of at least another 3-5 million barrels. 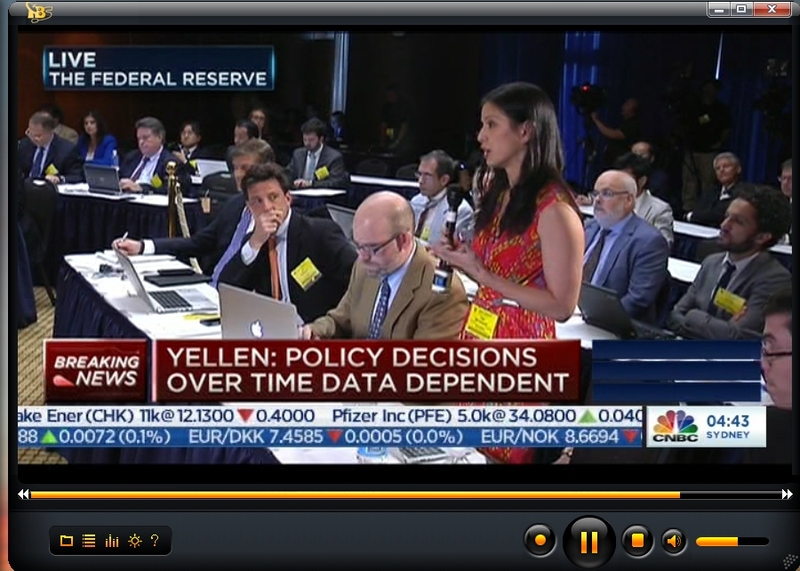 Of course, the big event will be the latest FOMC announcement, due at 2pm.. with a Yellen press conf' shortly after. Market is certainly not expecting (neither am I) a change in rates.. until the FOMC of Sept' 17th. FOMC spike.. and then down? Across the last few years one of the more interesting situations has been where the market spikes higher on the initial FOMC press release, maxes out within 5-15mins.. levels out.. and then unravels into the close. The setup for tomorrow is pretty reasonable for those looking to re-short the market. 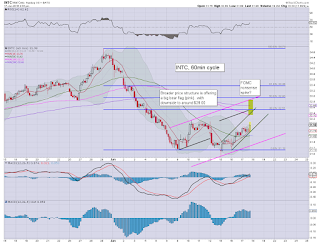 I'll have my eyes on INTC (it remains one of the more bearish price structures that I know of).. and will consider picking up some option puts tomorrow afternoon. US equity indexes closed moderately higher, sp +11pts @ 2096 (intra low 2082). The two leaders - Trans/R2K, settled -0.3% and +0.7% respectively. 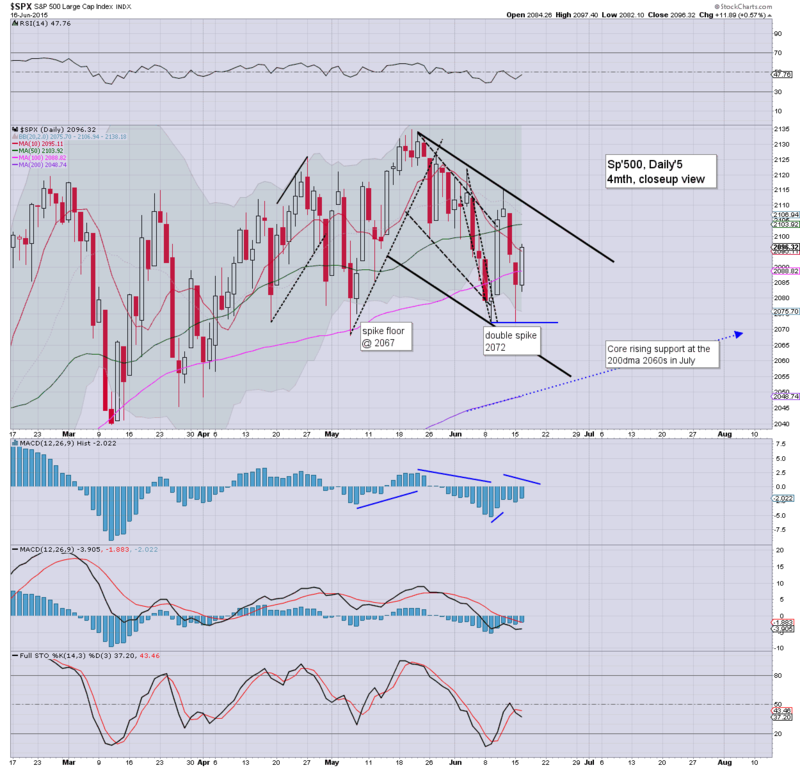 Near term outlook is for upside into the 2100/10 zone.. before resuming lower after the FOMC/Yellen are out of the way. 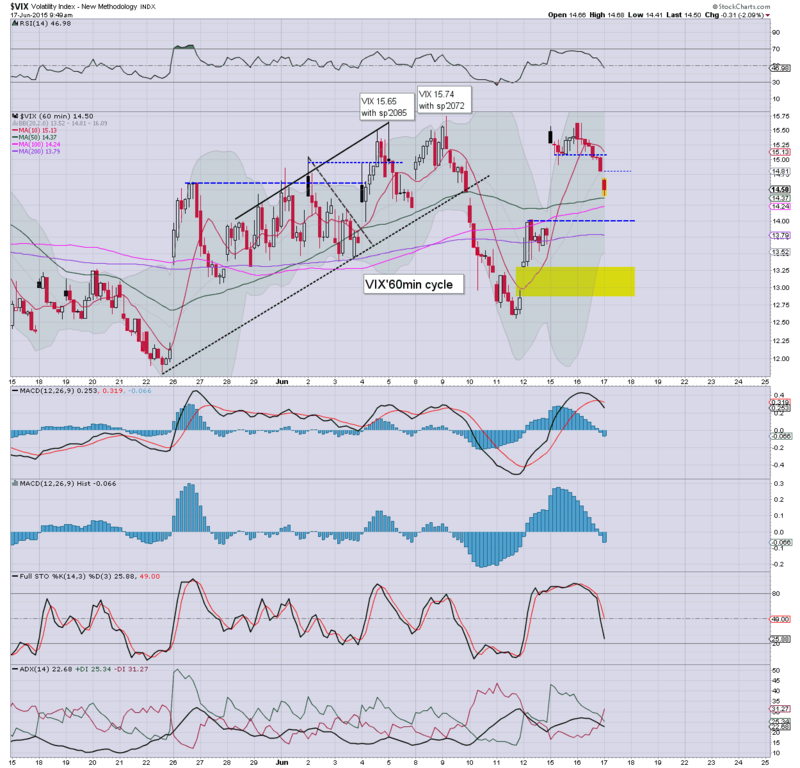 *Trans remains a serious laggard, as Oil flirts around the $60 threshold. 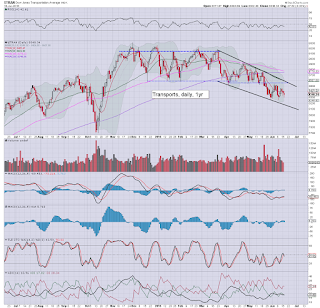 Trans 9000s look out of range for some months. Not much to add. A daily for the equity bulls, but clearly there is the threat of some significant (if brief) downside due to Greece... or renewed market concerned of a Fed rate hike at the Sept' FOMC. Best guess... upside tomorrow.. before resuming lower for the rest of the week.